TOG will be attending Coolest Projects 2016 at the RDS Dublin on Saturday 18th June. The event runs from 09:30 to 17:30. We will be running a show and tell area, soldering workshop area and a bridge building area. There’s lots to see at the event with Coder Dojo groups from all over Ireland showing off their projects. Check out the photos from the day in our gallery. 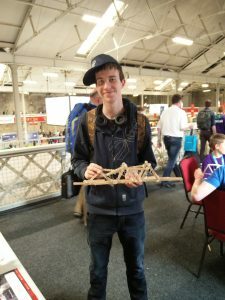 Below is the winner of the bridge building competition. This was written by gary. Posted on Friday, June 17, 2016, at 10:25 am. Filed under Advocacy. Bookmark the permalink. Follow comments here with the RSS feed. Post a comment or leave a trackback.